The Ritz-Carlton Sanya invites you to a colourful festive December at the tropical paradise. Savour the culinary delights of Christmas with your beloved at seaside; wander on the beach with family; spend a leisure champagne afternoon with friends. Christmas without snow can be romantic as well; New Year Day with warm sunshine is just wonderful. 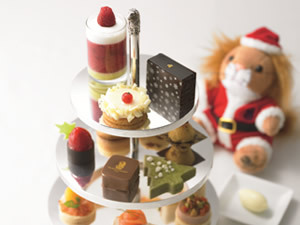 The Ritz-Carlton, Sanya invites all guests to the Christmas Tree Lighting Ceremony on December 2nd, 2011. When the night falls and the choir sound rises in the cosy lobby, hotel guidance team member and adorable Christmas angel will press the button together; not only the Christmas tree but also the festive atmosphere and everyone’s mood will be lighted by then. No matter you are in favour of exotic yet romantic Christmas Eve, or you are looking forward to a warm family dinner to celebrate the New Year, or you are wondering what a traditional Russian New Year like, you will agree that The Ritz-Carlton, Sanya is a perfect choice. Come to Fresh 8 and enjoy the International Christmas Buffet, let the flavours from all over the world please your tongue; go to Sand and wait for the first beam of 2012, let the brunch time pass with joy; walking on the beach and tasting the fine wine, let the amazing live show season the Russian BBQ; renowned culinary team of The Ritz-Carlton, Sanya will promise you a fantastic trip for your taste bud. Banquet Executive Chef Dmitry Sergeev from The Ritz-Carlton, Moscow moved his Russian New Year dinner table from Snow capital to Sunny paradise. The exotic Russian delights will be staged during January 5th to 8th. You will be immersed in all of the delicacies range from beach Lawn buffet to Tzar’s Brunch. Stop for a state of ultimate relaxation and tranquility during the festive season. ESPA at The Ritz-Carlton, Sanya tailor-made treatment called Total Escape which will leave your body and soul refreshed. Professional therapists with magical hands are willing to lead you to a calming and soothing journey. Santa Claus will be waiting for you in the Ocean Pavilion at The Ritz-Carlton, Sanya. We will create a snowy paradise beside the sea, let us catch the happiest smile on your face with camera, let your colourful memory be recorded by the specially design photo frame. Feel the wind from the wave, fill your glass by treasures and decorate your smile with happiness. 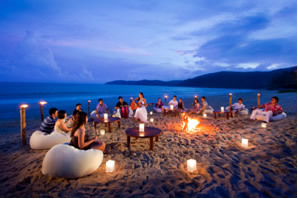 Join the New Years Eve Beach Party at the last day of 2011, raise your champagne and toast to 2012. After party features live DJ and cocktail show in ballroom is for those who are ready for whole night dancing. Raise your hat and glasses too, we will dance the whole night through. Run away from the stress, pack your vocation mood and leave the cold winter days behind. The Ritz-Carlton, Sanya is well prepared to create a warm vocation for you and the ones you care in this sunny corner of the world. Ritz-Carlton is the only service company to have twice earned the prestigious Malcolm Baldrige National Quality Award, which recognizes outstanding customer service.